Twenty-eight percent of sales reps and business development professionals are using social selling tools 3-5 hours per week, with over 20% spending 5-10 hours per week. So if you’re spending close to a quarter of your time using these tools, why switch between multiple screens? With LinkedIn’s Sales Navigator for Zoho CRM, view all of your prospect’s professional information from your CRM window—no more switching between tabs. Network, prospect, and build relationships all inside Zoho CRM. Let’s look at the highlights. A better sales pitch every time. It’s always better to know your prospect inside out before pitching to them. The integration allows Zoho CRM users to directly find information about their prospects—like their profile details, company information, and recent activity updates—on LinkedIn, without having to leave their CRM. Given that productive prospecting is a challenge for sales teams, this feature is no small benefit when you’re on your next sales call. Prospecting is an important aspect of sales. But it’s not the only aspect. You also want to build lasting relationships with your customers. 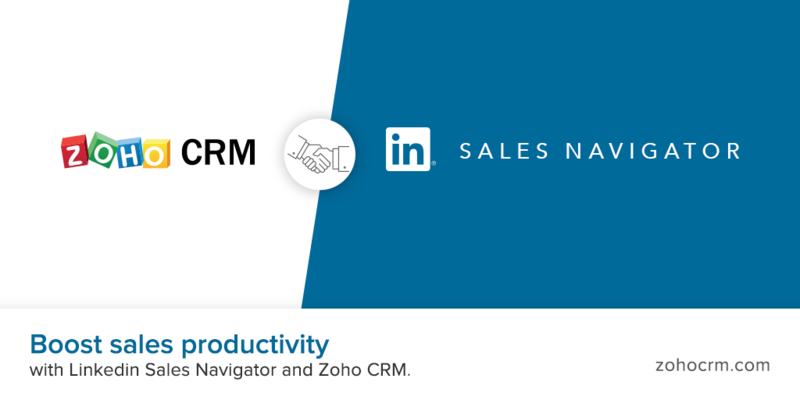 With LinkedIn Sales Navigator for Zoho CRM, discover things you and your prospects have in common, say a mutual friend on LinkedIn or a company where both of you have worked at. Leads leading to more leads. Every business wants more leads converting to sales. 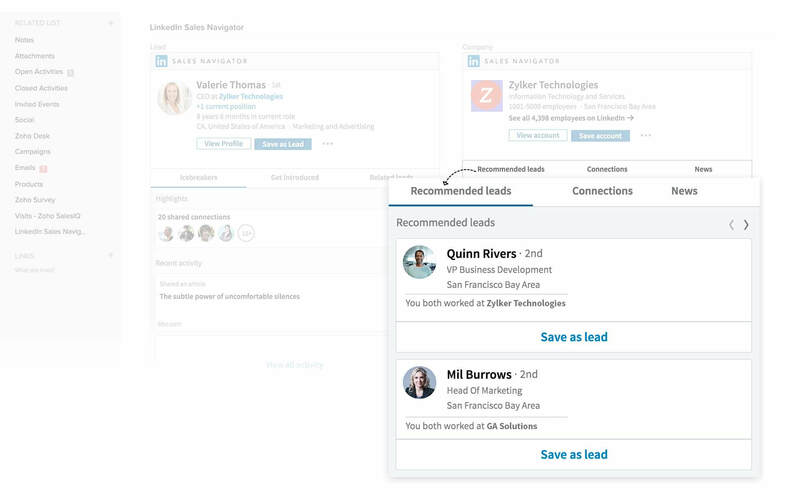 The Zoho CRM integration with Sales Navigator shows you a list of related leads while you’re viewing another lead’s details and matching them with their LinkedIn profile in your CRM. According to a study by CEB, 6.8 buyers, on average, are involved in the decision making process, making increased access to relevant leads more important than ever. Discover connections within your team. Prospecting helps you get as many prospects as possible, but how do you reach out to them in the right way? 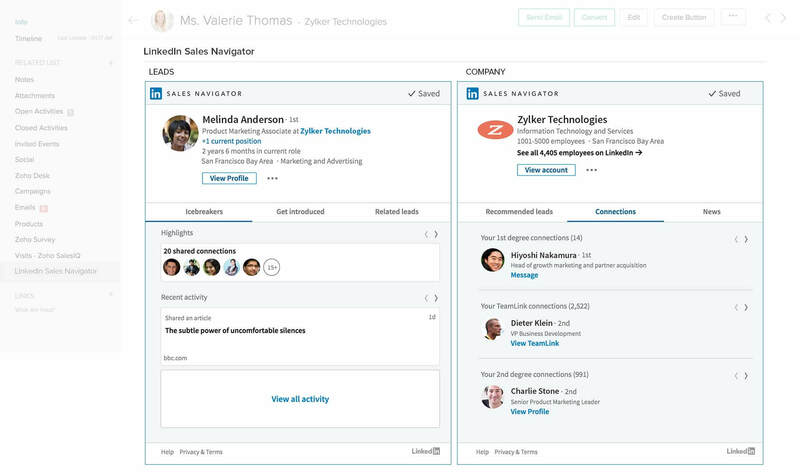 With LinkedIn’s Sales Navigator for Zoho CRM, view the connections you have with your prospects through your LinkedIn network, or find out common connections through your company’s network using TeamLink. Start growing your buyer network and make sales faster. Get the best of both worlds. Start using LinkedIn Sales Navigator for Zoho CRM today. Note: Requires Sales Navigator Team or Enterprise edition. Learn more about the different editions of Zoho CRM and Sales Navigator.